It's amazing! It keeps my floors clean! It has bluetooth capability and can turn it on where ever I am! It returns back to it's dock when battery is running low! I just love my shark robot vacuum...I set a schedule and he takes over and vacuums away. It was very easy to set up, and I can control him from my smart phone and/or my Alexa. If there is an area that I do not want the shark to go, I just put down the barrier strips that come with the Shark, and he will not vacuum in that area. I also love that I can be doing other things while my Shark vacuums my house. Highly recommend!!!!! I just love Robbie (that's the name i gave her). Everyone that has floors should have one. Robbie does floors like nobody's business. Not to mention navigating the corners. Just a delight to watch her work. Bettet get one!! Love Love my new Shark vacuum don’t need to vacuum everyday My Shark Robot does it for me!!! This lil guy has made my life easier, e cleans well however you mush train it to get close to baseboards. With a German Shepherd I have to empty the try and clean the brush frequently. They dogs are not afraid of it just curious. I would recommend it. 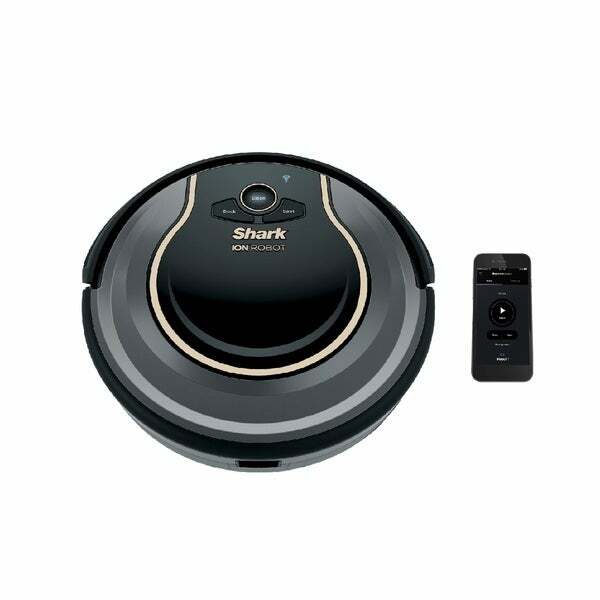 I bought the Shark Ion Robot 750 Vacuum for my daughter who ( absolutely loves it) she has three cat 2 of them are Persians and the Shark keeps her condo clean, what more could you want!! Received the Shark Robot Vacuum and have been using it probably three time a week. Was very easy to put together. This vacuum works very good. I have a dog and it picks up a lot of dust and dog off the floor. Runs a very long time, which is good. I would say this is a good purchase. You do have to clean the hair and dirt from the brushes or it won't run. That is explained in the instructions. All in all am very happy with purchase. This is my third Shark vacuum and my first robotic. I switched from Dyson years ago and I must say the Shark corded stick vacuum is my favorite, when I actually vacuum. This robotic vacuum is much better than the Dyson I purchased for my niece for Christmas. It does an excellent job on our hardwood floors and seems quiet compared to others I’ve seen. Although we have to empty the dog hair frequently, it’s much better than having to vacuum three times a day myself. I’m even considering purchasing another one for our upstairs too. This is our first robot vacuum and so far we have been impressed. We did a deep cleaning first and planned on letting the shark simply maintain the floors thereafter for light cleanup. Very impressed with the amount of fine dirt and pet hair the vacuum captures that our upright vacuum missed. Works great with the Alexa voice integration. Oh my!!! I looked all over at the reviews of this and several other Robot Vaccums, but kept coming back to this particular model. Once I made a final decision, I ordered this one and I am so very glad that I did! I named my Robot 750 Vacuum, "Sally Sue," and boy does she clean my carpet and tile outstandingly! I don't know how I have gotten along with out "Sally Sue!" She actually does an amazing job throughout the entire house and I couldn't be more pleased. This particular one has a wifi feature where you can program it to begin cleaning your floors while you're still at work. I like having the ability to be able to start the Vaccum from a simple press of a button on my phone! This was indeed a purchase/investment that was totally well worth the money! This vacuum has been an absolute godsend. I get a kick out of watching it work. We live on the river in a house with very old wood floors and have a chocolate lab who sheds constantly (never mind my own hair). Needless to say we have a lot of dust, dirt and hair. Sharky (he's like part of the family) gets it all. My only warning is that it is surprisingly tall and doesn't fit under my couch like I had hoped. It is great for getting under beds and other furniture with higher clearance though. You will have to get your corners and do a good cleaning every now and then, but with frequent use, you can keep things pretty clean with just this vacuum! Bought this as a Christmas gift for our daughter. After only using it for 2 weeks, it is now giving a message "suction motor stopped". She has tried contacting CS team, but it is always outside hours they have. Do it! Bite the bullet and get it! Instructions too difficult. Unable to understand programming the thing. Overall too much trouble. Am returning. This has been helpful and fun to use and there’s been no problems or issues with it. It works as listed and is fun to watch with my dogs. It is easy to use and clean and hooks up as an app to your phone. I don’t run it as often as I thought I would but that’s just because I don’t go through and pick up the cords like I should. I like having it though and it has made things easier at times and I am glad I bought it. "Does this vacuum come with the docking station?" "How is it on carpet"
My wife wanted one for Christmas and the reviews seem to be mostly 5 star.